I got puked on. My initiation into motherhood is now complete. The mess missed all carpeted surfaces and my hair (cause who wants to wash their hair at four in the morning?). Wade's been getting his canine teeth in. I'm blaming the above on his teeth, cause I want to. I was thinking they were all coming in, but I only see one budding. Does teething ever stop? These have been by far the worst - I feel for him...and me. Because of the grumpiness that the above has caused - for the entire household - we've been allowing just about everything. Bad habits are definitely in the making. Eating on the table. Playing with my phones (lots of these baby selfies). Too much TV. Oh, you found mama's glasses? Okay, don't throw them. Oh, you threw them...um...go pick them up. And sitting however he wants on the high chair + watching TV. Don't worry, he was still occasionally adorable. Lots of books. Him trying to climb the wall grate to the lightswitch. Found dada's hate. Pulle dout the duplo blocks - they end up down the stairs a lot. I found Wade some tunnels (for FREE!) and his life is now complete. He loves crawling though them, playing peek-a-boo on either side, rolling balls through and picking them up/attempting to carrying them around (which he HAS to do, even though he gets so frustrated). Bonus: another way to terrorize Stella. We finished painting! Finally our house is orange free! Nothing like leaving to really getcha motivated. Stupid. And by finished, I mean that I have to buy another gallon for a second coat in a few places, cause spending more money on paint is totally what I want to be doing. Just in time, cause my maternity paint clothes aren't fitting anymore. 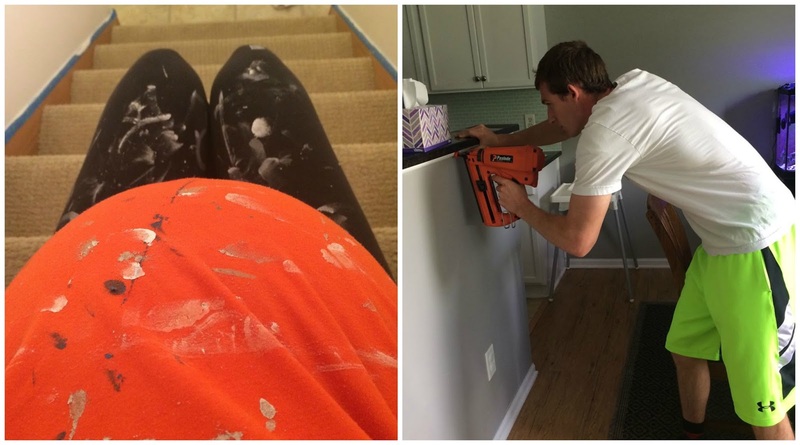 Doesn't everyone have maternity paint clothes? We worked on a bunch of other projects and got to play with some fun tools. My ward (church) threw my a baby shower! It was wonderful! I felt so loved. I am so so sad to be moving away from this congregation - we'll be in the same stake still and I keep telling myself that they're only 30 minutes away + I'll be on everyone's way to everything in the twin cities...but still, it's always sad. We got some matching blankets that Husband promptly opened and snuggled, some toys that I hid so Wade doesn't commandeer them, matching outfits - including some in Wade's size that I had to use great restraint to not put him in them, just to see. I went back and edited that sentence and took out the great many "adorables" and "cutes." Oh, and diapers. I've done some math and the answer is always the same - we're going to need a lot of diapers!! I had a doctor's appointment yesterday. Took my glucose test, which I failed. I'm guessing it's the Kool-Aid I stupidly drank that morning. Now I get to take a three hour test next week. On top of the three hour ultrasound I already have scheduled for next week. I can't quite describe how annoyed I am at going to the doctor's. I want these girls to stay in as long as possible, but maybe not too long cause I might drown in doctor visits. Luckily next week my in-laws are in town and are watching Wade. Whew (he went with my yesterday - him being sick and all, couldn't really leave him with someone with kids. He was a nightmare!). I'm 29 weeks, but my belly is measuring 36 (if this were a single). That's good, but makes me sad cause I got REAL uncomfortable with Wade around 37 weeks...so that's still coming. I was feeling high and mighty for how good I've been feeling, that's going to end. A woman in her car in the parking lot rolled her windows down to talk to me about my belly...I'm literally stopping traffic. And I was talking to a woman who also had twins and when she found out how long I have left she looked at my belly and her eyes got all big and she said she didn't know where they were going to fit- that is validation right there! This upcoming week will be filled with LOTS of family, Husband taking a few days off (WHAT?!?!) and hopefully some naps.